The Colosseum is one of Rome’s “postcard” images. It is very difficult to get without crowds and often repair/construction scaffolding. Ray Laskowitz’s comment on my recent post inspired me to think (and write) about this. His “been there, done that,” observation is insightful (as always). This is probably my favorite shot in Rome. I turned away from the crowds and made “my own” image. In the 1980’s and most of the ‘90’s, photography was a very different world. There were – seemingly – two different photographer groups out there: The serious (including pro) shooters with “sophisticated” equipment, training and experience, and “point & shoot” camera-toting tourists (not meant in a pejorative sense). This is my hands on favorite shot in Venice. The “postcard” image would include The Grand Canal and perhaps the Ponte Rialto, where the crowds can be unbearable. This one was made early in the morning, on a back canal. We used film. The point & shooters used color negative film and had prints made at the local drugstore. The serious shooters used a variety, including black and white, and color slides. Most of us had our developing done by either a local or mail-order photo processor. The serious among us worked hard for our images, scouting and studying locations and other photographs we saw. But there weren’t very many of us, and except for the very most popular sites, it was pretty normal to either have it to yourself or only be sharing with one or two other shooters on any given day. Differing accounts put the number of “smartphones” in the world in use at between 2.5 and 3 billion. Billion! And then came digital (of course, like all short writings, this is a bit of an oversimplification. But in general, I think these are valid observations). I have been as enthusiastic a cheerleader as anyone about the “digital photography revolution.” It has certainly made making images and showing them more convenient for me. And the “digital darkroom” has opened doors for me that I either couldn’t have opened, or at least not very easily. The Golden Gate, of course, is the big bridge in San Francisco, and is perhaps the most famous and photographed bridge in the U.S. And, it is not too difficult to catch, since there are multiple perspectives to shoot it from. But “my” image is this one – The “Bay Bridge,” taken at first light, from the Embarcadero. I was there all alone. But technology, we continue to learn, often comes at a cost. Differing accounts put the number of “smartphones” in the world in use at between 2.5 and 3 billion. Billion. One approach I have always advocated is to get up close and look for a more intimate image. This – if you can do it – excludes crowds and other shooters, and is likely going to be “your own” take on a scene. Compare that with about 5 million in 2000 (my research may be a bit questionable. I had a hard time finding this information, but this was from a site that gave numbers of shipments of digital still cameras during the years 1999- 2018. Presumably, this would include DSLR cameras). Incorporate 3 billion smartphone users (they all have cameras, and so virtually all smartphone users have now replaced the “point & shooters” noted earlier), with the combustive growth of digital media and you have a true explosion of the conditions I mentioned in the early paragraphs of this blog. As I noted in the last blog, it is difficult for me to illustrate the difference between a small crowd of shooters in 2013 and absolute mob scene we encountered in 2017. So what do we, as photographers, do now? I am as much a fan of the “postcard” iconic image as the next guy. Indeed, in an earlier phase of my photographic quest, I sought primarily those images. Even though somebody had already done it, I wanted to have “my own.” No apology for that. I worked to get this “already done” image, even doing a bit of “photoshopping” to get it the way I wanted it. However, there are some palpable certainties that come with the “new age” of digital and smartphones. One is that the opportunities to make these “postcard” images have gotten much, much more difficult. You will have to plan to be present at odd times (which can be difficult for a traveler that is not staying in a destination). You may have to fight the crowds, and thus, change the physical perspective of your images. I have never been to the Jenne Farm, which is the most photographed barn in New England, but have heard the stories of having to “fight” for tripod position even before sunrise. Instead, my single favorite Vermont Barn scene is this one, which I learned about from a friend. There are not very many shots of it out there (yet). And in the end, Ray is right. We need to get away from the crowds and the icons; away from the “tripod holes” already made by others. I have known it for some time, and my own shooting has (glacially, I admit) evolved in that direction. These days, I look for my own images of the place (those are much more, “my own” than a copy of the postcard shot). And many times those images are away from the crowds, or at the edges of the crowds. My best imagery seems to come when I can spend some time in a location and get out very early or be out late, when the tourists are in bed or in the bars and restaurants. Unfortunately, this is not always possible, because of our chosen method of travel, which often puts us into places during mid-day. Even so, I have found images when I have been looking for them. Recently, I went through a review and update of my LightCentric Photography photo website. As I was systematically checking captioning information (among other things), a couple of the images made me pause and reflect on their circumstances as involving a particularly memorable moment of for whatever reason, just being in the right place at the right time. Sometimes it was planned. Sometimes it was just serendipity. This doesn’t mean there haven’t been other times and images. There have been too many photographic memories to cover, including trips to New Mexico, Alaska, New England, California, and around the world. In some ways, the Porcupine Mountains image is my most memorable photo. Taken back in the days of film, I made this photograph on my very first “dedicated photography trip.” I spent a long weekend in Michigan’s Upper Peninsula (U.P.) for the first time since my childhood. The trip was planned with much anticipation of fall color imagery. For the most part, even though I was there during the first week in October, I was still fairly early for foliage, and was largely disappointed in that aspect of the trip. The trip motivated many more similar excursions to the U.P., mostly in the fall. I arrived at “The Escarpment,” in the Porcupine Mountains late on a Saturday afternoon. From the Escarpment, you can view the Lake of The Clouds, which is often photographed – especially during peak foliage. Conditions were not what I had hoped for. It was cloudy, with a 40 plus mph wind. I had seen images of Lake of The Clouds, and that was my goal for this part of the trip. Foliage conditions were just starting, and I just did not see the image I had visualized. To make matters worse, the forecast called for worsening conditions, with all-out rain by morning. So I took a number of images, using a much faster shutter speed and lower aperture combination than I normally would have, bracing the tripod against the wind buffets with my own weight (seemingly counterproductive). Unlike these days, you could not see a representation of the result on the back of the camera. I would wait until I returned home, and the photographic processor completed developing my slides. I didn’t expect much from this location. But on the light table, this one image jumped out at me. It is perhaps the only “keeper” from that take. As I viewed it, I realized that the contrast between the lingering greens, the precocious reds, and the developing oranges and yellows, was actually more visually interesting – indeed satisfying – than some of those images that I had seen that were a complete wash of fall color. There is a photographer’s saying: “F8 and be there.” I don’t think this was F8, but I was there, and this is what I found. The image here, is prepped for printing, and may look a bit saturated. But I did not touch the saturation sliders in Photoshop. Instead, I used an old technique (surpassed for most of us by plugins such as NIK Viveza 2), converting the scanned image to LAB color space and making adjustments to the A and B curves. This image has continued to be my best selling photo. It hangs in the main conference room of my law firm’s offices, and draws many comments. In 2006, after much bragging to my best buddy, Rich Pomeroy, about the “best fall foliage in the world, bar none,” he called my bluff and we took a week long trip to Vermont. We had take many business trips together before, but this was our first “together” photography adventure. I am delighted to say that we have made numerous other photo trips, and will make many more in future years. But this one turned out to be kind of a bust. We went during the last part of September and very early October. All during the week, we wished we had waited a week, as the foliage was again in very early (almost non-existent) stages. We worked hard to find some foliage and though we had a lot of fun and made some memorable images, it wasn’t what we had anticipated. Determined to “find” those colors I remembered from my youth in the 1970’s in Vermont, I returned – alone this time – in 1997, a week later. During that trip, I spend a couple nights in central Vermont, driving along it famed Route 100. Mother Nature can be fickle, and the colors were – once again – not as nice as I had hoped (this time a bit past peak in many places). One morning, I was headed for a waterfall that has turned out to be (in my opinion) unremarkable; Moss Glen Falls in Granville. But on my way, I got waylaid by a vision: some color off in the distance of a scenic turnout. The turnout turned out (see what I did there 🙂 ) to be a nice series of drops in the Mad River. The Mad River is really just a stream or creek that is not really navigable. It is also the namesake of “Mad River Canoes,” originally built by hand in Waitsfield, where this very same stream wandered through his back yard. A drizzly rain was falling, but I donned my wading boots and spent 2 1/2 hours shooting there. The image here was actually on a return trip in 2010, when I brought Rich back to “prove” my assertions about Vermont foliage 🙂 . That morning was a magical time. I was all alone with the subject, which remains a really photogenic series of waterfalls. In 2009, Rich and I made another memorable photo trip; this time to Acadia National Park in Bar Harbor, Maine. Bar Harbor is a quaint little touristy town with just enough non-photographic things to keep our spouses entertained (well, for about a day that is – but we were there for a week 🙂 ). Acadia is probably one of the most photographed National Parks. There a numerous books about the Park Loop Road, and all the different photographic venues. Otter Cliffs is one, but it is most often viewed more distantly, from another cliff to the north. From the vantage point, you cannot even see this cobblestone beach. I had a friend who strongly recommended that I “work” to find this spot, which is a cobblestone beach that is not well documented or marked (at least, it wasn’t in 2009). The directions in the books don’t really reveal it, but with some perseverance, and some insight from him, we did find it. We visited it for 3 successive mornings in the pre-dawn, before we got this one. There is really nothing like being in a location like this, literally alone, and watching the sunrise and the morning develop. It was a location worth “working” for. Vermont has a special place in my heart. 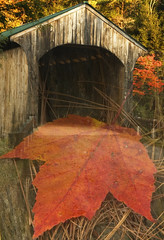 Readers here know I make period trips to Vermont to photograph; usually during the vaunted fall foliage season. I wrote my first eBook on this very topic. As I did my homework, planning each trip, researching and hobnobbing with members of the Scenes of Vermont forum, I “met” two of my wonderful friends, both of whom also happen to be talented photographers and writers. Al Utzig and I carried on a e-mail correspondence for several years before I finally had the pleasure of meeting him in person. We were good friends by that time and the face-to-face didn’t change that (for me at least – I’ll let Al be the judge of it 🙂 ). Carol Smith, who many of you know as my co-author for the current edition of Photographing Vermont’s Fall Foliage,” was a frequent poster on the Scenes forums and we were all soon to learn, an extremely knowledgeable and observant resource for wannabe Vermont photographers. She was of immeasurable help to me on the first edition and it was a logical progression for her to co-write a second edition which contains much more information, primarily from Carol. In the process we also became good “online” friends. In 2010, Rich and I returned to Vermont. I was there for a week, but Rich was only able to join me on the southern part of the trip for about 3 days. This trip began with a group of us (particularly Al, Carol and me) meeting at Carol’s Barton house in anticipation of a next-day, early morning “tour,” led by Carol. This was my first face-to-face meeting with Carol, and to my surprise, she still loves me :-). We started at Bean Pond along the US 5 highway, for a foggy sunrise over the pond. The time and images were magical, but while Al and I gushed, Carol promised that the best was yet to come. And boy, was she right. The Burton Hill Road image is by far my personal favorite Vermont image, and perhaps my most “successful.” After others had left, Carol and her very patient husband, guided me around several other areas, including the Craftsbury Common image that appears on the cover of the Vermont eBook. But that morning is one of the most memorable times of any photographic trip. And I got to enjoy it with two of my very favorite friends. Some years were big travel years for me. Others not so much. 2010 was one of those big years. In addition to another trip to Vermont, my wife, son and I went on our first cruise; the Inside Passage from Vancouver, B.C., to Whittier, Alaska. It introduced us to cruising (which to my surprise, I really liked), which has opened travel doors to us throughout the world. There were hundreds of images taken on that trip to Alaska, with some pretty great photographic opportunities. But the most memorable image of that trip came as a complete surprise to me. We were signed up for a “deadliest catch” look-alike excursion (sans the cold and ice and heavy oceans). When we came ashore, one of the crew who met us saw my “big camera” and said “I see you came prepared. We are going to get some eagle photos for you today.” Right. He was a tour guide. He certainly wasn’t going to promise me crappy photos. 🙂 I think we were scheduled to be out for 3 1/ or 4 hours, during which they talked about the history of these fishing boats (the boat was an actual boat used in the Bering Sea, just like the ones on the “Deadliest Catch” series, which had been shipwrecked, and then salvaged and retro-fitted with observation seating). All very interesting, but no “knock your socks off” eagle photos. We saw some, but they were a long way in the distance. At the end of the cruise, they announced that they had a special treat for us, and took us by an uninhabited island, which was in native waters (by U.S. treaty) and therefore not subject to U.S. laws. As I looked, I saw a solitary eagle perched in dead tree. O.k. Then I suddenly heard “plop.” “Plop, plop.” The crew was up in the flybridge tossing bait into the water. The skies next to our boat suddenly turned into what I can only describe as a air to air dogfight as about 30 eagles all appeared, diving and often fighting for the food. I really wasn’t prepared and it all happened in about a 5 – 10 minute sequence. But in spite of my ill-preparedness, I was able to get several good shots. This one is my favorite. I doubt that I will ever get an opportunity to photograph eagles in flight from that close a position again. As our first cruise, it was hard to have it come to an end, with so many amazing and new experiences. But it did. It marked the end of a great trip – and the beginning of many more. In 2011, instead of a fall foliage trip, my wife and I opted to spend a week in California during the first week in October. My daughter lives in San Francisco, so we used that as a staging point, with an overnight excursion to Napa for some wine tasting. Lots of memories from that trip. My daughter’s place at the time was in downtown, south of Market Street (SOMA). She was just two blocks south of Market and just a few blocks west of the Bay Bridge, the Embarcadero and the eastern part of San Francisco bay. I was up early and somewhere on the street each morning by sunrise or earlier (the 3 hour time differential was a positive, making it easy for me to wake up and roust early). What I really noticed was the relative stillness, just before the world “wakes up.” I made numerous images of the Bay Bridge, which is a favorite subject of mine (I prefer these images to those I have made of the more famous Golden Gate). But this one, I think, best illustrates that early morning pre-dawn calm and stillness. That trip had other memories. We made friends with a couple of the winery owners, and in later years would travel with one of them, to the Caribbean and to Ireland, as well as returning to the vineyard when back in California. But the unexpected and incredible opportunity of shooting the air show put on by – mostly – the U.S. Navy, during its San Francisco “Fleet Week,” is one of those once-in-a-lifetime opportunities. We shot from the ground for over an hour as the planes flew low over us. I worked hard to capture a “bloom” from the jet fighters as they broke the sound barrier. Because sound and light do not travel at the same speed, it was touch to anticipate. I got just one. But am pretty pleased with it. Returning to California, Rich and I were able to sneak in a quick 3-day trip to West Virginia’s Babcock State Park, to photograph the often photographed Grist Mill in fall foliage. While we probably missed the peak near the mill, we were able to find peak foliage around Boley Lake in the park. What made this trip special was my first opportunity to meet one of my photographic mentors and a great inspiration to me, James Moore. Jim is an uber-talented nature photographer with many sales and publications; primarily in and around West Virginia. We had become on-line friends a year or two before, and he had a group he was guiding there photographing earlier in the week. Jim was still there when we arrived, but left early the next morning. We had a nice time to chat and he gave us some great insight about when and where to shoot in the park. In 2012, Jim did me the great honor of asking me to act as a guide for one of his photography workshops in Michigan’s Upper Peninsula. Jim had heard a lot about it but had never visited there. We spent a great week, learning, shooting, and watching the foliage develop from pre-peak to full peak conditions. Jim had some health problems later in life and sadly those of us who knew and admired him have lost touch. For the West Virginia image here, my model was Jim, and the New River Gorge lookout was one of his favorite spots in the park. 2012, marked yet another photography trip with my buddy, Rich (and spouses). We joke a lot because I am a “planner” when it comes to these trips. I have usually figured out what I want to shoot, how to get there, how long it will take, and what time of day to be on site. For the most part, Rich is happy to let me do that, and quite often comes home with the better image. 🙂 A couple years before, Rich had attended a photography workshop in Jackson Hole, and the Grand Teton National Park. We both wanted to go again. This time I showed up and Rich was the guide. What a fun and memorable week with many great photo opportunities. As an old school photographer (or maybe just an old photographer), when it comes to scenic shots, I think in terms of a print. What we all want to bring back is a “wall-hanger.” Over the years I have made, printed and framed a number of my images. None has been better that this image of Oxbow Bend. We arrived here (I think the second time) in the pre-dawn hours and there was frost on everything. As the sun rose, the warmer water temps created a wonderful low fog over the bend in the river. May some white cotton-candy clouds would have enhanced this, but it was a great morning and I knew walking away from this shoot that this would be a wall-hanger. 2013 was a huge year for us. My wife came from a military family, so she had done some limited world travel as a young person. But in our adult lives, we had not traveled out of the U.S. except for a couple trips to the Caribbean, and Canada (which really doesn’t seem like it counts 🙂 ). We decided to kick our cruising up a notch, and booked a Mediterranean Cruise. In many ways, it may have been the most memorable of all of our cruises. It was our third cruise on the Princess Lines, and we were booked on their newest, and best ship. We were excited to see the world over the next two weeks, disembarking from Venice and ending in Barcelona. The cruise ship decided it wouldn’t cooperate, and our cruise was cut short. There was, however, a happy ending to that. As is our custom, we planned to spend 3-4 days in our originating port city before boarding the cruise ship. We walked around Venice for 3 days and boarded the ship thankful for an immediate “day at sea,” exhausted. But what I can say about Venice is that it is wall-to-wall “eye-candy” for the photographer. I have hundreds of Venice images, but the two shown here represent moments that separate themselves from the others. The Gondolier was a case of right time, right place. I was looking for shots, and heard them coming. I found this setup and was blessed with wonderful early morning sunlight. The covered gondolas is not original on my part. I had seen at least one other photographer do this. What it would need was very early light in order to make an exposure long enough to capture the motion of the rocking gondolas. This meant either very early morning, or evening. I chose morning because there would be less people, and less activity on the Grand Canal, producing just some gentle rocking. I use this image on my Facebook LightCentric Photography Page Cover. In 2014, we returned again to San Francisco for several days. I made more trips to the Bay Bridge. I also walked to the San Francisco Giants ball stadium. My daughter took us to Lands End, to see the Golden Gate Bridge from a different perspective, and to Jones Beach. But what I remember the most is walking from our SOMA location, all the way across town and uphill to Lombard Street (the famous s-curved, brick-paved, switchback street that is a “must photograph” when you visit). I made the usual images (except for the nighttime shot with the streaky headlights). Then I looked for something else to shoot. A unique perspective that possibly nobody else had ever done. I think I might have been successful. In 2016, I made a last minute trip to join my buddy, Rich, who was in Newport, Rhode Island for business. I flew in on Thursday evening and we spent two days shooting. Friday morning, I was on my own and walked around the downtown area and the wharfs, making lots of photos of boats, buildings, etc. Everything was a more or less nautical theme. That evening we went to shoot a lighthouse that Rich had found earlier in the week (Castle Hill Light). This was a photogenic lighthouse, and as we often do, we arrived early to scout best perspectives for shooting. And then we waited on the light. It is often worth waiting for the absolute last of the light to see if anything magical happens in the sky. To our west, the sun set over Narragansett Bay, with beautiful orange skies, but no real photographic interest. But as we watched and waited, this white sailboat approached and passed. Knowing a little about sailing from my past, I made note of the wind, and calculated that the boat (it was actually a large, tour charter boat on the last leg of the day) would come about and come back toward us. I quickly swiveled my tripod head around, took some metering measurements, and waited to frame the boat where I wanted it to be. I knew I would get 2-3 shots at best of this quickly moving boat. 2018 has been kind of a slow year, photographically. But we absolutely made up for that in 2017. In July, we spent a week in Tokyo and Kyoto, Japan. We saw many amazing sights and I did my usual early morning walking around both cities. I was intrigued by Tokyo Tower, lit at night, and worked hard to find a good place to photograph it from. I took a few from a couple different places. But it turns out that the best I could do was through the window of our Tokyo Hotel. In September, we made our 3rd, and much anticipated Mediterranean Cruise. We again spent several days in Venice. One of the other places I had seen and wanted to shoot was the Greek Island of Santorini. We had a wonderful tour guide, who happened to also be a photographer, and he the right time and place for us to be to get shots I am certain I would never have found without his help, in spite of the research I had done. Did I mention that Venice is “eye-candy” for photographers? Ditto Santorini. Well. This was an interesting exercise for me. I tried to keep it to not more than 15 images. There were many more that perhaps fit the bill. And I am sure there will be more to come. As always, thanks for reading. As I noted in my recent blog about my quick U.P. trip this fall, I did have an opportunity to scout two new areas. The first was the Escanaba Area, and particularly, the Garden and Stonington Peninsulas, which I covered in the previous blog. My plan was to to shoot as much as possible around the good light, but if the weather was uncooperative, to make the approximately 1 hour drive to Iron Mountain, Michigan. Perhaps unfortunately, the weather was not very cooperative all weekend. Perhaps best known these days for its provenance for nationally noted sports coaches, Iron Mountain’s welcome sign boasts of being “the “proud hometown of Tom Izzo and Steve Mariucci.” But it certainly is also world-renowned for its namesake. At one time, Iron Mountain held one of the largest iron ore producing and processing resources in the world. There is still a mine there, which can be toured. While I am not sure I would consider the area a photographer’s destination, a day trip would probably be filled with opportunities. The color in Iron Mountain was still nice, but well past “peak” when I was there in the second week of October. Escanaba is approximately 50 miles further west (from Escanaba) on U.S. 2. Being inland and at a higher elevation, this area’s probable normal “peak” is late September to early October. Just to the Northeast of the downtown area, is a nice small lake, Lake Antoine. The northern 1/2 of the city of Iron Mountain borders the west endo of the lake. There is a significant residential presence around the west side of the lake. On the east end, is Antoine Park, a public beach, picnic and boat launch. I found a small memorial park with a fishing pier on the way to the lake, and make a couple images. Antione Lake Road loops around the lake and crosses U.S. 2 both to the east of and to the north of town. About 4 miiles east of downtown is the small community of Quinnesec. In about 2 1/4 miles, you will come to County Road 10 (a/k/a “Upper Pine Creek Road), which goes north, to The Fumee Recreation Area. The entrance is marked, but it is a rustic sign, about 1 mile north of U.S. 2. There is a parking lot and no motorized travel is allowed beyond. There are two lakes, “Little Fumee Lake,” and “Big Fumee Lake.” The recreation area has several trails around both lakes, with a total of about 8 miles of trails, which are used by walkers, runners, bicyclists and horseback riders. I walked the short trail around “Little Fumee.” Again, the light was awful, but I could see the possibility of some nice imagery. The Michigan e-Book had a perhaps unbalanced focus on the northeastern U.P., particularly in the area between Munising and Paradise. This encompasses much of the “Pictured Rocks National Lakeshore,” and the Hiawatha National Forest. But my continuing research seems to support the proposition that this is still one of, if not the most fertile ground for the outdoor and landscape photographer. There is just so much to shoot in a fairly compact area, that it remains the most “bang for the buck” destination, especially for a new visitor. Having spent a lot of time in and around Munising, I only had a brief window to travel to the U.P. this fall and I wanted to explore some areas that I had only touched on and had not extensively explored. The eBook has only coverage of Fayette State Park, and a couple nice waterfalls in this area (all of which I had visited on a short trip in late October, 2007). So this year, I spent the better part of 3 and 1/2 days driving and exploring (and occasionally shooting) in the Escanaba area. I’ll summarize some of my “findings” here. Farm on Stonington Peninsula; Michigan U.P. The area which I am calling “The Escanaba Area” is a part of the U.P., which is basically the south-central part of the main peninsula, nearly bordering on Wisconsin. The area is bounded on the south by Lake Michigan. To the east of Escanaba are two peninsulas, which extend south into Lake Michigan; the Stonington Peninsula, and the Garden Peninsula. Stonington is the first peninsula, to the east of Escanaba, and forms Little Bay De Noc and Big Bay De Noc, between the “mainland” and the peninsula. My hastily planned trip had not included any particular destinations on this peninsula, but perhaps some driving and exploring. I have a friend who has a cottage on the Stonington Peninsula, however, facing Escanaba, and I was able to stop and see him – and get some suggestions for possible shooting locations. The bays De Noc and their peninsulas reach toward the iconically famous “Door” Peninsula of Wisconsin which forms Green Bay, in Lake Michigan. Originally, my primary focus was originally on the Garden Peninsula. I arrived there on Friday afternoon. “Garden” sounds awfully inviting. I am not sure where the name comes from, but it is really not anything unique as far as Michigan goes. Fayette State Park (an old iron smelting operation in the late 1800’s) is a few miles down the west side of the peninsula. The area was preserved as a State Park in 1959, and the grounds are nicely kept. Most of the old buildings, including brick blast furnaces, some housing, and timbers in the area where the ore boats docked, have been preserved. Most of the trees around the park, including up on the bluff behind the harbor, are Beech, Birch and other varieties, which tend to turn a bit later and last a bit longer than the more colorful Maples. They are more yellow, rust and orange in coloration, but still provide a nice photographic opportunity. There are a couple very large maples on the grounds near the furnaces that seem to also turn later. Most of the U.P. was well past peak the weekend I was there. The harbor, called “Snail Shell Harbor,” is a harbor of refuge on Lake Michigan and has a nice modern harbor which can hold just a few boats at a time. My shot of the old crib timbers was made from the modern harbor, and is one of my favorite “U.P.” Images. The drive down to Fayette State Park begins at the small community of Garden Corners, at the northern base of the peninsula, where U.S. 2 intersects with MI 183. As you follow down toward the park, you pass through the town of Garden. It appears to be a mix of farm and summer dwellers, and there is nice harbor – Garden Bay – that the town borders. Wikipedia notes that it has a year-round population of less than 1,000 people, and the median income is well below the U.S. officially published “poverty” line. As I approached Garden, I was greeted by the bittersweet view of one of the near-ubiquitous “Wind Farms,” that have cropped up over the State of Michigan. I am certainly cognizant of the desirability of cultivating renewable energy resources. And where there is water, there is wind. At the same time, It is hard to see these massive, whirly-gig, towers as bucholic or photogenic. Form subsequent research, I learned that this was the first wind farm in the U.P. It has been the subject of some controversy, and appears at the moment, to be the only such farm in the U.P. Unfortunately, I saw very little sun and experienced mostly grey, dreary sky and drizzle for most of the weekend. While overcast conditions can sometimes enhance colors, in my opinion, there is only so much you can do without including the sky in landscape photos. So This weekend would not turn out to be very good for shooting. I drove the perimeter of the Garden Peninsula, including a stop at Fayette State Park. By this time of year, the park is essentially closed up for the season (although I think it was still “officially” open), and almost deserted. That is actually a good thing for a photographer. I briefly walked parts of the park, and confirmed in my mind that this is a location definitely worth a stop. I took a couple cross-roads, also, as thought I had recalled some “long view” farm scenes which might reveal some fall color as well as views of the lake in the background. It may well be that inhabitants of the area could tel me otherwise, but I did not find anything really worth a stop on the balance of the peninsula. Farm Scene; Stonington Peninsula; Michigan U.P. The Stonington Peninsula, however, revealed several worthwhile items and some rather picturesque driving, particularly along the eastern side of the the peninsula. Though not necessarily providing the “long view” of Lake Michigan in the background, there were – nonetheless – some nice farm views. Had the weather been more inviting, I might have spent more time exploring some of the side roads and shooting. My first “stop” in Stonington was provided by my friend who had the cottage nearby. There is a public boat launch just south of the small community of Stonington, called the Farmer’s Dock. There is a nice rock bluff to the northeast across the water, that was nicely lit by the only sunrise I saw all weekend. Saturday morning turned out to have some early sun and then some late sun, alas with the same cloudy, dreary conditions in between. My research told me that sunrise was around 8:00 a.m. (one of the positives of fall shooting is that the days are shorter – which means the mornings aren’t so awfully early 🙂 ). My hotel was about 45 minutes from the dock, so I left at 7:00. The dock is just under 14 miles down Delta County Road 513, from the intersection of U.S. 2, east of Rapid River. The boat launch entry is on Swede 13 Road. While I cannot say this is a recommended destination, if you are in the area, it has some promise. After the sunrise, I headed across the peninsula, in search of a “tunnel of trees” my friend also recommended. About 2 miles back north from the Swede 13 Road intersection, on CR 513, you come to the intersection of CR513 and Old K10 17 Road (approximately 12 miles south from U.S. 2). K10 will take you east across the peninsula. In about 6 miles, you will cross County Road 511. In about another mile, you will turn south and after about another mile, east again. At some point the road will have changed from pavement to gravel. As you round the bend, you will see the tree tunnel, which appears to go on for about 2 more miles. Colors were mostly yellow, gold and orange. But it is an impressive tunnel. I drove a few more of the back roads on this part of the Peninsula, but really didn’t find much else to photograph. There are lots of “curve in the road” shots, but none that really got me excited. I did follow County Road 513 to its southern end, on Peninsula Point, where the Peninsula Point Light stands. It is not a particularly noteworthy or photogenic light, and I did not even take a “record” image. For the lighthouse hunters out there, it may be worth the drive, though the last mile or two is a narrow 2-track. I drove up the eastern side of the Peninsula during the balance of the morning, and then down the coastline along Lake Michigan to the historic town of Nahma. County Road 513 goes nearly the entire length of the peninsula, and to the north, is where I found some nice farm scenes. Again, the poor shooting conditions meant that I didn’t make as many stop, nor explore the side roads as much as I might otherwise have done. My morning ended by visiting the so-called historic town of Nahma. While it may have some charm in the busy summer months, there was little going on there this afternoon. They do have some pretty well preserved natural areas. I stopped a couple times along the Sturgeon River, which empties into Lake Michigan just west of the little downtown. The opening image was made there. I spent my afternoon driving up the Hiawatha National Forest Road H-13, up to just south of Munising. The sun peaked out for an hour or so that afternoon and I visited the old haunts: Pete’s Lake, Mocassin Lake, Counsel and Red Jack Lakes. Hot afternoon sun made any shooting pointless, but I was able to confirm that they still hold their place as premier shooting destinations. Headed back toward Escanaba, I decided to find a rather difficult to find, waterfall; Whitefish Falls on the way home. I was able to find it, and discovered some significant changes, which I will discuss in an upcoming blog. I finished the day at the National Forest Campground boat ramp back on the Stonington Peninsula. The entrance to this boat ramp is just 2 miles south of U.S. 2 on County Road 13. There was some nice color there, but I was really too late for any good sunlight for shooting. But Mother Nature obliged me with the only sunset I saw all weekend. Once autumn arrives many of us who are outdoor photographers wait with at least subdued excitement for the foliage changes that occur, particularly in the northern and western parts of the U.S. Over the years, I have come to expect a week or two of cool, sunny-to-partly-sunny, weather during the month of October. When November comes, those of us in the northern parts, and in the mountainous regions in higher elevations know the show is over and winter is coming. From my observation, this year was odd. From all appearances, the foliage in the Northeastern U.S., was reasonably good, to spectacular in some places; what we have come to hope for in early to mid-October. But the weather has been “November” weather: cool, windy, cloudy and rainy. Certain “conventional wisdom” has it that rainy, overcast conditions actually enhance color foliage photography; intensifying color that can be captured because of the lack of short, blue light rays that cause randomized reflections. To a point, I concur. This is particularly true with closeup images. But that same conventional wisdom acknowledges that photography, at its core, is about light. Good light = good imagery. Bad light often results in wasted effort. I often use that time to scout locations, and sometimes to shoot to make “record” images or to look later at composition. And, in my view, solid, gray overcast skies make for bad light. What I am looking for is either partly cloudy with puffy white clouds, or “edge” weather (just before or after a storm) which can create dramatic lighting. My time in the field has been abbreviated this year. I spent 3 days in the Michigan “U.P,” exploring new territory (for me). Based on others’ images, I may have missed the best color, which seemed to be evident in my old “hunting” grounds in the Northeastern U.P., and perhaps up in the western portion in the Porcupine Mountains. In our eBook, Photographing Michigan’s U.P., Kerry Leibowitz and I concentrated heavily on the northeastern region from Marquette to Sault St. Marie, along the southern shore of Lake Superior, and in the Hiawatha National Forest. Those places are still the premiere locations. But in my Travels, I had spent a brief stint in the Escanaba area. Two peninsulas jut down into Lake Michigan just east of Escanaba, which is the southernmost part of the U.P., on Lake Michigan. Without intending to denigrate Escanaba, for the outdoor photographer, does not appear to hold much interest for outdoor photographers. If there is any promise, it would be during the summer months, when the boat marina is full of boats. My interest, however, was in the two peninsulas. The first one, immediately east of Escanaba, forms Little Bay De Noc. I am not certain the peninsula has a name, but since the small community at the southern tip is Stonington, for my purposes, I will refer to is at “The Stonington Peninsula.” The second peninsula, further east, is known as “The Garden Peninsula.” Lest you get excited about what the name suggests, it gets its name from the township and community which is at its northern base; “Garden Township.” If Kerry and/or I ever get ambitious enough to edit and write a Second Edition, we will augment the brief coverage of this area with some of my findings. In the meantime, I will probably just do it as a series of separate blogs here. I was able to make a day trip from my Escanaba motel to Iron Mountain, Michigan. Iron Mountain is perhaps best known as the hometown of MSU basketball legendary coach, Tom Izzo, and NFL coach Steve Mariucci. But long before they were born, Iron Mountain was one of the top producers of iron ore in the United States. Its higher elevation meant that the foliage there (mid-October) was past peak, though there was still some lingering color. But I did find a couple areas worthy of some photographic interest, including a waterfall I had not yet had the opportunity to visit. This was my first time in Iron Mountain. And finally, I was able to visit Whitefish Falls (not to be confused with Laughing Whitefish Falls) which is addressed in the eBook, but has been difficult to find in the past. As my separate upcoming blog will confess, I may have added to that difficulty (stay tuned for some clarification). As the images here illustrate, it was difficult to find nice light for photography. As they will also illustrate, the Munising area (northeastern U.P.) still holds the top honors for diversity of color and imagery. Fall Foliage: The “Best” Time? Red Jack Lake; Hiawatha NF; Michigan U.P. This time of year, some of us get “antsy” about the progress and success of leaf turning, weather, and in general, the logistics of getting on to great fall imagery. A number of basically dormant internet sites during the remainder of the year suddenly heat up. Some “old friends” show up. Every year, there are a number of new joiners to some of the sites. Some are looking just for “leaf peeping” and travel advice. Others are seeking information about photography. Where to go. When to go. What to expect. Lodging. Traffic. Weather. There are so many questions. And predictably, they are generally the same questions from year to year. Predictably, they are generally the same questions from year to year. Presque Isle River, Porcupine Mountain State Park; Michigan U.P. Perhaps the real point is that you can find some pretty nice opportunities and views without being on destination at exactly the “right” time. I spent a number of years of my youth in Vermont, working and later attending college. I remember some pretty spectacular color shows. Yet when I travel back there, it seems like hard work to find some of those scenes. When I lived there, I was (obviously) there every day and could see things develop and take advantage of the “peak” times – when they occurred. In 2012, I guided a photo-workshop in the Michigan U.P., for a pro that I got to know from Pennsylvania, and for perhaps the first time in many years, arrived when the “show” was pretty well under way and watched it develop to peak and then a bit past peak. The opening image of Red Jack Lake is – arguably – at “peak.” But again, “peak” will be different things to different observers. The best time for fall foliage is very much environmentally driven. Weather is the biggest factor. And weather – despite the irony that there are people who make their living “predicting” it – is nothing if not unpredictable. There needs to be enough moisture through the late months of summer and early autumn to keep the leaves green and healthy. A very dry “runup” period is a recipe for dull color and early leaf drop. Then, the conditions during the generally brief window of time when they begin to change to the point where they drop is equally critical. Cooler temperatures, particularly at night (think frost), is what will kickstart the color change. Wind and heavy rain can also be the death knell for fall foliage viewing and photography. Obviously, the timing of this can be only very generally predicted. There are numerous other factors to consider. Disease and predators can create negative conditions. Over the years, I have noted a shift from the very bright reds produced predominately by Maple trees in Vermont, to more of an orange, yellow and brown mix. Part of this is because of some blight and leaf cutters that have attacked mainly Maple trees, and caused damage and early drop of those species. Geography and topography can also make their mark. Generally, higher elevations experience “turn” sooner than lower elevations. Areas that are in the lee of significant bodies of water will generally experience later color change than areas more inland. This is almost always evident in the area of Vermont on the eastern shore of Lake Champlain, and on the west coast of Michigan, and on the peninsulas that cover the Great Lakes. Some of the northernmost parts of the U.P. often turn weeks later than other areas further south and inland. So, while we can try to plan for the “best” time for our visit, there is going to be a significant element of chance. Photographing Vermont’s Fall Foliage; 2nd Ed. Planning is still important and getting as much useful information about a planned destination as possible will help manage expectations. There are a number of resources, mostly on-line, that are useful, including local weather pages, and foliage progression charts. While I am admittedly biased 🙂 , I think that perhaps the single best resources for fall photography are my own eBooks. Photographing Vermont’s Fall Foliage; now in its second edition, and co-written by my good friend and talented photographer, Carol Smith. We have illustrative photographs and detailed directions and relevant information about many great foliage-viewing and photographic spots throughout the state of Vermont. Photographing Michigan’s U.P., co-written by another friend and talented photographer and writer, Kerry Leibowitz, does pretty much the same thing for Michigan’s vaunted “Upper Peninsula” (which I will argue, rivals New England for fall foliage viewing and photography). THE Photographer’s Guide To Minnesota’s North Shore, written by another very good friend, Al Utzig, another talented photographer, writer and teacher (who I also met on the SOV forum originally), gives a pretty thorough account of photographic opportunities on Minnesota’s North Shore, along the Lake Superior shoreline. This area is also not lacking in great fall foliage opportunities. Some years back, while researching a fall trip to Vermont, I stumbled on the Scenes of Vermont Forums. This site is a wonderful resource for visitors to Vermont, and to some extent, all of New England; particularly in the fall. I soon became friends with the proprietor of the site, became a moderator, and even talked him into adding a photo forum. Unfortunately, these stand-along forums have become less popular due to the dominance of social media sites like Facebook. But one of the things it does better than any other is to provide “boots-on-the-ground” information during the short and unpredictable foliage season. I highly recommend a trip there. A good friend (we met on the Scenes of Vermont forums), Margy Meath, yet another talented photographer, also has a very good Facebook Page; Vermont Foliage Fanatics, which has a number of “cross-over” members from SOV. If you are a Facebooker, I recommend checking that out.